PGP is an encryption system that uses both private and public keys. Public keys are 160 bits or 40 hex bytes. There are very hard to transmit by voice over the telephone. So a system similar to the tango foxtrot scheme that the military uses was invented. This Applet will interconvert the hex and keyword forms. for the current version of PGPKeywords. Displays PGP keys as a list of keywords. This makes it easier to proofread. 694K zip for PGPKeywords Java source, compiled class files, jar and documentation to run on your own machine either as an application or an Applet. access pgpkeywords source in repository with [Tortoise] Subversion client on wush.net/svn/mindprod/com/mindprod/pgpkeywords/. 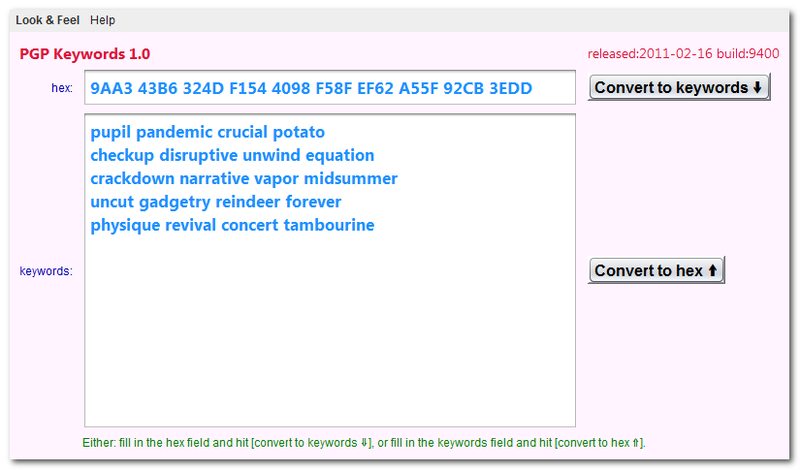 download ASP PAD XML program description for the current version of PGPKeywords. PGPKeywords is free. Full source included. You may even include the source code, modified or unmodified in free/commercial open source/proprietary programs that you write and distribute. Non-military use only.